What a joy it is to return to the world of Barbara Pym, a place where the most difficult decision anyone has to make is what to serve the new vicar when he comes over for tea. (If only real life were like that, everything would be so much simpler.) While clergymen are in relatively short supply in Pym’s 1955 novel Less Than Angels, there are plenty of anthropologists to be found, drawing once again on the author’s own experiences of life at the International African Institute in London where she worked for a number of years. The novel focus on the lives, loves and concerns of a group of British anthropologists and the individuals they interact with as they go about their business from one day to the next. Pivotal to the story is Tom Mallow, a twenty-nine-year-old academic who has just returned from Africa where he was tasked with observing the societal structure of a particular tribe. On his return to London, Tom moves back in with his companion, Catherine Oliphant, a thirty-one-year-old writer of romantic fiction and articles for women’s magazine. I say ‘companion’ as Catherine’s relationship with Tom is a little hard to define – more ‘old married couple’ than ‘boyfriend and girlfriend’, Catherine is fond of Tom in spite of their differences in outlook. Back at the research centre in London, Tom meets Deirdre Swann, a young, impressionable anthropology student who falls instantly in love with him and everything he represents. Deirdre lives in the midst of the suburbs with her mother, maiden aunt and brother, where she enjoys a quiet life surrounded by the comforts and traditions of home. Tom, for his part, is also attracted to Deirdre, whom he views as sweet and straightforward and easy to get along with – unlike Catherine who is somewhat more forthright in her views. On the surface, Less Than Angels seems a more serious, more reflective novel than some of Pym’s other early works, certainly judging by those I’ve read to date. There is a poignant note to Tom’s story, one that only reveals itself as the book draws to a close. Nevertheless, Pym’s trademark dry humour is never too far away. There are the usual priceless observations of human nature, and it is often the most trivial of matters that prove to be the most troublesome, especially where academic institutions are concerned. In this scene, we gain an insight into an earlier disagreement between Miss Clovis, the new caretaker of the research centre, and her former employer, the President of a Learned Society – an incident so *serious* it had prompted Miss Clovis to hand in her notice! The activities of the other young students attached to the research institute also provide some delightful moments, especially when they try to make a good impression with their tutors in the hope of securing a research grant. In one such development, Professor Mainwaring invites four students – two male and two female – to a weekend retreat with the express purpose of observing them at close quarters. It’s an event that ends in frustration – not just for the students hoping for funding but for Mainwaring too. There is also much to enjoy in the character of Rhoda, Deirdre’s nosy maiden aunt, who seems intent on doing a little anthropological research of her own – so interested is Rhoda in other people’s business that she can barely contain herself. I also loved the character of Catherine, a bright, independent young woman with much more insight into the workings of the wider world than Tom gives her credit for. While Less than Angels isn’t my favourite Pym, it’s still very much worth reading, especially if you’re a fan of her work. In writing this book, Pym seems to be saying that one doesn’t have to travel to Africa or be a qualified anthropologist to study the foibles of human nature; one can just as easily observe these things at home without any specialised training. Less Than Angels is published by Virago; personal copy. This entry was posted in Book Reviews, Pym Barbara and tagged #ReadWomen, Barbara Pym, Fiction, UK, Virago on January 8, 2019 by JacquiWine. 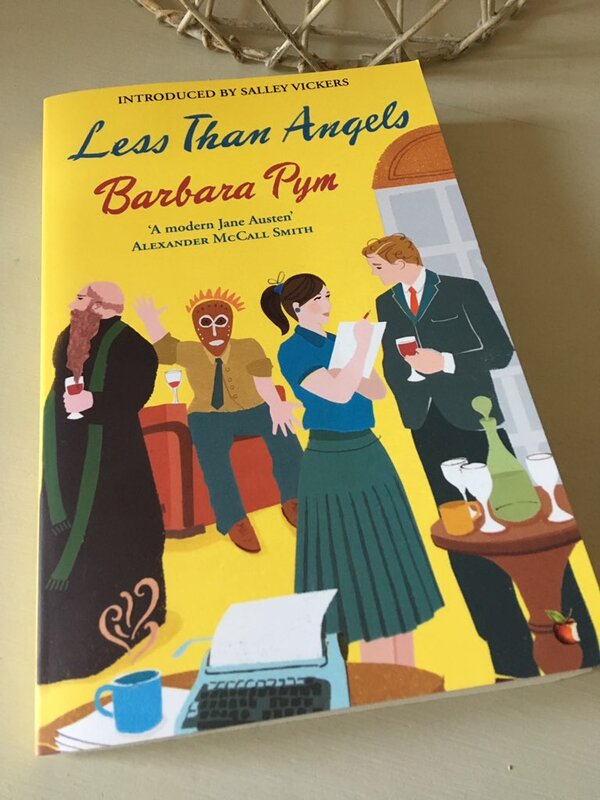 I have written before about my love of Barbara Pym’s novels, populated as they are by ‘excellent’, well-meaning women, amiable clergymen, fusty academics and one or two more spiky characters – usually female. It’s a world that seems at once both rather absurd and strangely believable, full of the sharply-observed details of a genteel English community in the 1950s. 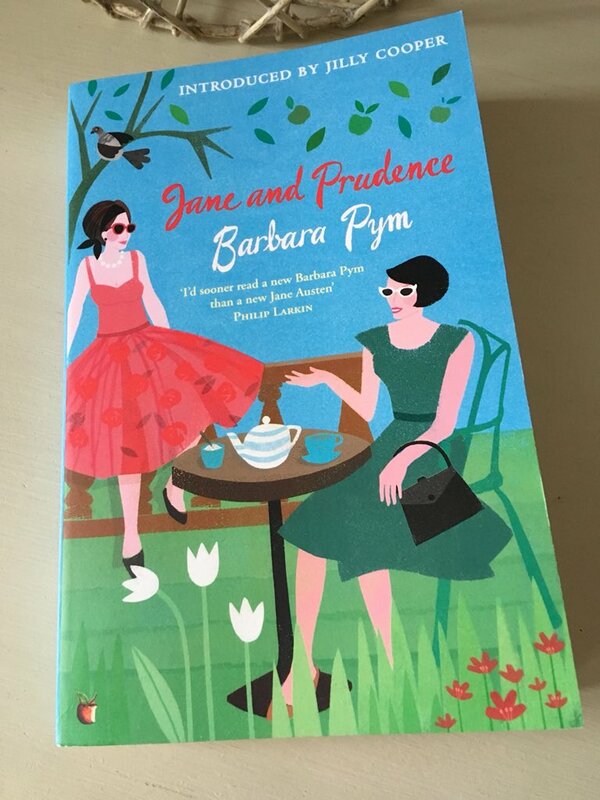 Jane and Prudence is another sparkling addition to Pym’s oeuvre, a charming story of unrequited love, the blossoming of unlikely relationships, and the day-to-day dramas of village life. Towards the beginning of the novel, Jane, Nicholas and their eighteen-year-old daughter, Flora, are in the process of moving to a new parish in the country, clearly hoping that they will be greeted by a gaggle of eager parishioners. While Jane is amiable and well-intentioned, she is less than ideally suited to the role of a clergyman’s wife, liable as she is to mild indiscretions and a touch too much honesty. Her frumpy, ill-matched clothes give her the appearance of a farmer’s wife all set to feed the chickens, and her down-to-earth style means she lacks some of the social graces of her predecessor, the wife of the much-revered Canon Pritchard. Nevertheless, Jane and Nicholas love one another dearly, and they seem happy enough in their new home. If only they didn’t have to get embroiled in those petty disagreements amongst the more opinionated members of the parish council, then everything would be fine. Jane’s real area of interest is in finding a desirable match for her friend, the bright, elegant and relatively independent Prudence. Much to Jane’s dismay, Prudence seems to have slipped into a sequence of unsatisfactory, shallow love affairs – mostly with unsuitable men. Jane was too wise to appear anything but casual in her tone as she mentioned this eligible widower. She knew that the pride of even young spinsters is a delicate thing and that Prudence was especially sensitive. There must be no hint that she was trying to ‘bring them together’. In time, Prudence pays a visit to the Clevelands, the village whist drive being touted as the main social attraction of the weekend. Here she meets Fabian, and the pair slip away for a quiet drink together at the local pub. With her natural distrust of good-looking men, Prudence is a little wary of Fabian at first, but after a few dinners and trips to the theatre back in London, their relationship soon starts to develop. Fabian himself is a very interesting character, perhaps more complex than he appears at first sight. I love this quote about his late wife, Constance, a passage that says as much about Fabian as it does about his former partner. As the story plays out, there are some unexpected developments, one or two of which show that we can find solace and a form of love with the most unlikely of potential partners. Once again, Pym shows her keen eye for a humorous scenario and an interesting personality or two. There is an opportunity to revisit the formidable Miss Doggett and her sharp-witted companion, Jessie Morrow, a wonderful pair of characters who were first created by Pym for her delightful social comedy, Crampton Hodnet. (The novel was originally written in the late 1930s but published posthumously in 1985.) There is also the gossipy Mrs Glaze, a sort of daily woman/help who seems to enjoy busying herself around the Clevelands’ house. Her observations on the comings and goings in the village are a real delight. Finally, there are Prudence’s work colleagues, the rather parochial Miss Clothier and Miss Trapnell, both of whom appear to be more interested in trying to take the moral high ground over their time of arrival at the office than in the duties they are to carry out once they get there. Pym’s trademark descriptions of food and clothing – hats in particular – are also in evidence. In this passage, she manages to convey Miss Doggett’s self-assumed superiority over the other ladies who help out at the church while also describing their headwear. While there is no curate here for the ladies of the village to fuss over and cherish, Pym does offer us a kind of curate substitute, the rather charming Edward Lyall, the local MP. Lyall proves to be an admirable replacement for the young innocent when he captures the villagers’ attention at the whist drive. All in all, Jane and Prudence is another marvellous novel from Barbara Pym. Once again, she gives us an insight into the lives of her characters, women in particular, and their desire to feel valued. In many respects, several of Pym’s central protagonists are women living on the fringes, their lives feeling somewhat unsatisfactory and unfulfilled – almost as if they have become accustomed to waiting in the wings, observing others from a distance. Nevertheless, by the end of her novels, one usually gets the sense that these individuals are somewhat better off, more content with the world and their place within in it. I certainly feel that’s the case here with Prudence – and with Mildred in Excellent Women, too. Jane and Prudence is published by Virago Books; personal copy. This entry was posted in Book Reviews, Pym Barbara and tagged #ReadWomen, Barbara Pym, Book Review, Classics Club, Fiction, UK, Virago, Virago Modern Classics on June 26, 2018 by JacquiWine. 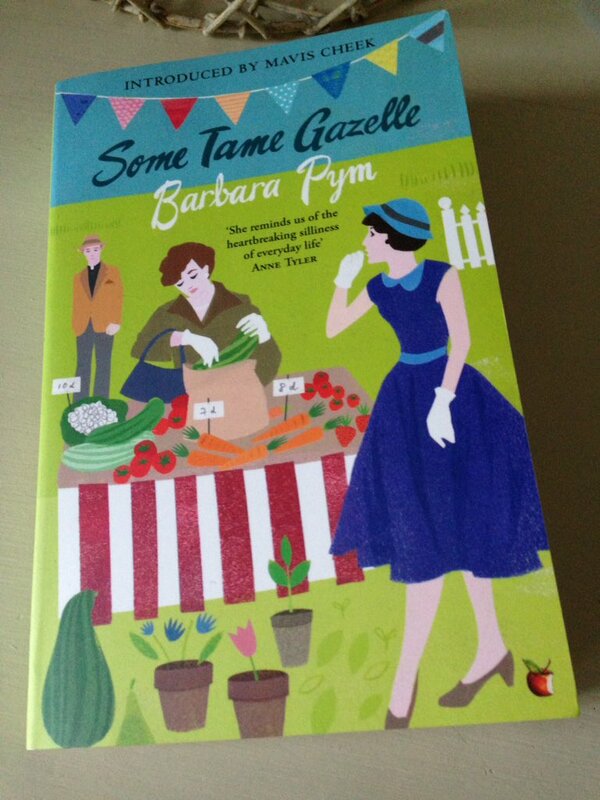 Barbara Pym began writing Some Tame Gazelle back in 1934 when she was just twenty-one, an impressive feat considering that the novel’s main protagonists – Belinda Bede and her sister Harriet – are both in their fifties. The characters are loosely based on Barbara herself and her elder sister, Hilary. In essence, she imagines what their lives might be like in another thirty years, both sisters unmarried and living together in a house in a quiet little village in the countryside. In this early novel, Pym begins to map out her territory, creating a world populated by unassuming gentlewomen, impressionable young curates, slightly fusty academics, and one or two more spiky characters – often women. This is a world where the most pressing concerns are what to serve the Archdeacon and other notable guests at supper and what to wear to the forthcoming church fete. Naturally, everything is beautifully observed in typical Pym fashion; she has a wonderful eye for social comedy, tempered with touches of poignancy here and there, qualities which give the reader much to enjoy. The novel’s set-up is fairly straightforward yet rather delightful. Belinda and Harriet Bede are both spinsters in their fifties, living together in a quintessentially English village at some point in the 1930s or ‘40s. Their lives revolve around the day-to-day business of the community, most notably those activities connected with the church. Belinda has been in love with the Archdeacon Hoccleve for the past thirty years, a man she first met and dated in college where they enjoyed a mutual appreciation of the English poets; but now that the Archdeacon is married to the formidable and efficient Agatha, Belinda must remain content with worshiping him from a safe distance, fantasising over whether he still retains some affection for her after all these years. On the other hand, Belinda’s sister Harriet is more preoccupied with the sequence of curates – all young, pale and undernourished – who pass through the parish on a regular basis. She lavishes her attention on them, inviting them for supper and afternoon tea whenever the opportunity arises – this in spite of the fact that she has received several proposals of marriage from the charming Count Bianco, a somewhat melancholy Italian gentleman who remains faithfully devoted to her in spite of a string of gentle refusals over the years. In short, both sisters take comfort from having someone to cherish – which brings us to the novel’s title, a quote from a verse by the English poet Thomas Haynes Bayly. On the surface, very little appears to happen plot-wise in the first third of this novel, but as ever with Barbara Pym, the devil is in the detail. The characterisation is spot-on, often deeper and more subtle than it appears at first sight. Belinda is the main focus here, and in some ways, she is almost a forerunner to Mildred, the central protagonist in Pym’s follow-on novel Excellent Women. Belinda is a hugely sympathetic but slightly meek woman who often puts the needs of others before her own desires. Guided by the social conventions of the day, she is forever conscious of doing and saying the ‘right’ thing, especially when in the company of others. Nevertheless, deep down, Belinda longs for a slightly more fulfilling life, one where she could share a few more moments with the Archdeacon, if only Agatha were not in the way. I love this next quote, one that conveys so much about Belinda as a character – and Pym as a writer, concerned as she is with the little details that reveal so much about the trials and tribulations of day-to-day life. By contrast, Harriet is much more flamboyant and outgoing than her sister, her personality coming through loud and clear in this next quote on her choice of outfit – Mr Donne, the new curate, has just arrived at the Bede’s for dinner. The Archdeacon too is another delight, a rather pompous man prone to quoting lines from obscure poems and works of literature in his sermons, much to the bemusement of most of his parishioners. A bit of a martyr at heart, the Archdeacon is forever complaining about the amount of work he has to do in his job, despite the assistance of his curate and the little coterie of diligent church helpers. Heaven knows what Belinda actually sees in him, but there must be something there – perhaps it’s a sense of comfort and familiarity, akin to the attachment to a favourite pair of slippers? Pym is also very astute when it comes to observing the small slights in life, those casual little put-downs that can have an impact on a person’s feelings, especially someone as sensitive as Belinda. In this scene, Belinda is wo-manning the vegetable stall at the church garden party. With only newspapers at her disposal, she has chosen The Times as the most suitable wrapping for Lady Clara’s marrows, a decision which is soon overturned when Agatha Hoccleve appears on the scene. ‘What’s this?’ asked Agatha sharply, pointing to the Times-shrouded parcel which Belinda had put into a corner. ‘Oh, that’s Lady Clara’s marrows,’ Belinda explained. ‘Wrapped in newspaper?’ Agatha’s tone was expressive. ‘I’m afraid that won’t do at all.’ She produced some blue tissue paper from a secret hiding place and began to undo Belinda’s parcel. Belinda dislikes Agatha but feels rather guilty and ashamed of herself for doing so. After all, everyone has their individual flaws and shortcomings, even Belinda herself. Then, just as we think that nothing of any consequence will happen in this sleepy community, a sequence of events come together to unsettle the lives of the Bede sisters. Firstly, Agatha goes away on her own for as few weeks to enjoy the waters at a European spa, leaving the way clear for Belinda to see a little more of the Archdeacon on his own should she so wish. Then Nicholas Parnell, a University Librarian and old friend of Belinda’s, arrives in the village with his assistant, the dashing Mr Mold – a bit of a ladies’ man by all accounts – a development that puts Harriet in a bit of a spin. And finally, a Bishop from Africa, who turns out to be a former curate of the parish, comes to visit the Archdeacon, a trip that results in surprising developments for more than one lady in the village. By the end of this charming, beautifully observed novel, a number of marriage proposals will have been issued, but how many (if any at all) will have been accepted? After all, as one of the Bede sisters reflects on her personal situation, ‘who would change a comfortable life of spinsterhood in a country parish, which always had its pale urate to be cherished, for the unknown trials of matrimony?’ Who indeed. Some Tame Gazelle is published by Virago Books; personal copy. This entry was posted in Book Reviews, Pym Barbara and tagged #ReadWomen, Barbara Pym, Book Review, Classics Club, Fiction, UK, Virago, Virago Modern Classics on October 3, 2017 by JacquiWine. While reading Muriel Spark’s Memento Mori last year, I was reminded of the delights of Barbara Pym’s novels, two of which I read in 2016: Excellent Women and No Fond Return of Love. They came as a set of three from The Book People, the third being Crampton Hodnet, which was published posthumously in 1985. In spite of its late publication date, Crampton was actually written in the late 1930s, just after the outbreak of WW2, an event which resulted in Pym’s attention being directed towards her work in the WRNS. When she returned to the novel in the mid-1940s, it seemed to her to be too dated to be publishable at the time, so it sat among her papers until her death in 1980. Viewed from a 21st-century perspective, Crampton doesn’t seem too dated at all. There is a timeless quality to many of the emotions and behaviours on display here, and they remain just as relevant today as they were back in Pym’s heyday. 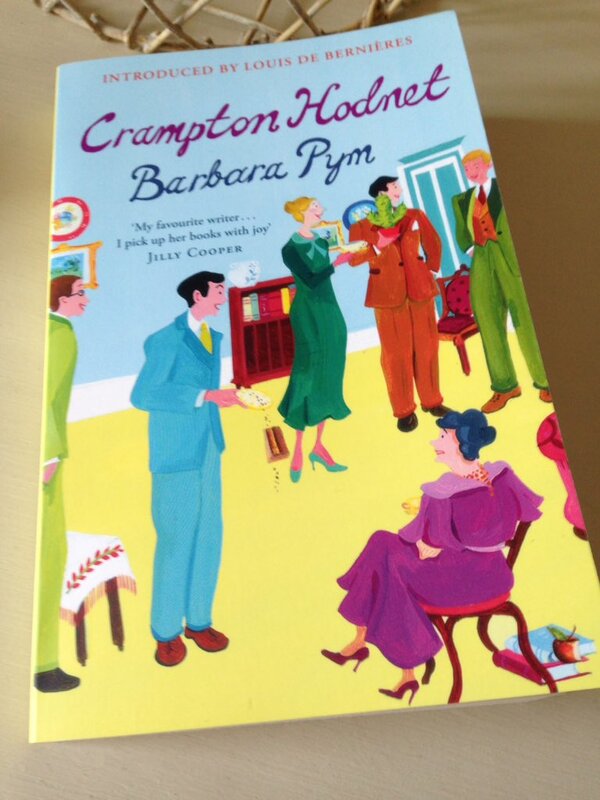 Crampton Hodnet is a delightful comedy of manners set in North Oxford in the late 1930s, a familiar Pym world of charming curates, mildly ridiculous academics, romantic students and gossipy women. At the centre of this close community are the redoubtable Miss Doggett and her paid companion, the much younger Miss Morrow, ‘a thin, used-up-looking woman in her middle thirties’ who seems old before her time. In spite of being considered as somewhat ‘unworldly’, Miss Morrow is in fact rather more perceptive than other people realise. She is kind, level-headed and tolerant, especially when it comes to dealing with her demanding employer. Here is a wonderful introduction to the meddling Miss Doggett – some male undergraduates are about to arrive for afternoon tea. Into this community comes a handsome new curate, the charming Stephen Latimer, who soon finds himself moving into Leamington Lodge, the home of Miss Doggett and her companion. One of the most interesting elements of this novel is the relationship that develops between Mr Latimer and Miss Morrow, an easy friendship at least in the first instance. But Mr Latimer was glad when, by some movement of the crowd, he found himself next to Miss Morrow. If he had analysed his feelings he would have realised that he turned to her with relief, as one does to a person with whom one need not make conversation. But there was no personal quality in his feeling for her. He regarded her simply as a man might regard a comfortable chair by the fire, where he can sit with his slippers on and a pipe in his mouth. Not long after he moves in, Mr Latimer misses evensong after getting delayed during a mildly furtive walk in the country with Miss Morrow, an episode that gives rise to him telling a white lie in the hope of covering his tracks. Meeting the vicar’s wife on his return, Latimer claims he was helping a colleague at another parish in the Cotswolds – in the non-existent village of Crampton Hodnet, hence the novel’s unusual title. Of course the vicar’s wife suspects a budding romance may be developing between the new curate and Miss Doggett’s companion – and perhaps she could be on to something there, as it’s not long before Mr Latimer decides that ‘he might do worse’ than marry Miss Morrow. There are hints of some scandalous entanglements with women in Stephen Latimer’s past, so a sensible wife and helpmeet might just be the answer to the complications that can arise from potential admirers. What follows is a desperate attempt at a half-hearted marriage proposal on the part of Mr Latimer, one which leaves Miss Morrow in no doubt that she must turn it down. Miss Morrow is a bit of a romantic at heart, and it is love she is hoping for, not respect and admiration. Alongside the Latimer-Morrow storyline, there is another romantic entanglement at play here as Francis Cleveland, a married University tutor in his fifties, loses his head over one of his students, the pretty and intelligent Barbara Bird. Francis, who also happens to be Miss Doggett’s nephew, is treading water in a staid but comfortable marriage to his wife of over twenty years, the efficient and level-headed Margaret. In essence, he feels somewhat marginalised and redundant in his own household. When Miss Doggett spots Francis taking Miss Bird to tea, she is convinced that something untoward is afoot. Even though she is desperate to meddle in her nephew’s affairs, Miss Doggett decides to keep a watching brief on the situation in the hope that it will develop into something even more scandalous in the future. This element of the story gives rises to several priceless scenes as Francis starts behaving like a love-struck teenager, declaring his passion for Barbara in the middle of the British Museum, an outburst that causes the young girl to pause and think again. In spite of her romantic tendencies, Barbara knows that her love is a wild, school-girl crush, not something deep and meaningful to be acted upon or taken seriously. If that were to be the case, who knows what might happen? Other calamities soon follow including a slightly unfortunate trip along the river and a romantic adventure that doesn’t quite go according to plan. There is also space in this novel for a third romance, the blossoming of young love between Francis and Margaret’s attractive young daughter, Anthea Cleveland, and the ambitious young undergrad, Simon Beddoes. All in all, Crampton Hodnet is a thoroughly charming and engaging social comedy. In fact, I think it’s the funniest of the three Pyms I’ve read to date. While Crampton does not necessarily have as much depth as Excellent Women, it is an extremely enjoyable novel, all the more so for its pin-sharp characterisation and multitude of hilarious developments. In some ways, the book seems to be saying that wild, passionate, ‘romantic’ love is rather idealised and troublesome, whereas a love that is lasting and fulfilling is much harder to find. Irrespective of the central message, the scenes in this novel are so brilliantly observed, underscored as they are with Pym’s trademark insight and wit – even the little details are spot-on. I couldn’t resist this final quote about Mrs Doggett and her hat (Pym is marvellous when it comes to capturing a character through their dress or hat). As the story draws to a close, there is a sense that life in North Oxford will continue as before from one academic year to the next; it is only some of the people who will change. Crampton Hodnet is published by Virago Modern Classics; personal copy. This entry was posted in Book Reviews, Pym Barbara and tagged #ReadWomen, Barbara Pym, Book Review, Classics Club, Fiction, Muriel Spark, UK, Virago Modern Classics on January 11, 2017 by JacquiWine. Earlier in the year, I had a lot of fun with Barbara Pym’s much-loved novel, Excellent Women (1952). It came as part of a set of three Pym novels from The Book People, so when Simon reviewed No Fond Return of Love (also included in my purchase), this sounded like the ideal follow-on read. On the first evening of the conference, Dulcie meets Viola Dace, a fellow indexer who happens to be staying in the room next door. At first sight, the two women present quite a contrast to one another – Dulcie looks rather dowdy in her tweed suit and brogues while Viola appears more confident with her black dress and rather unruly hair. As the two women get talking, it becomes clear that Viola knows one of the speakers at the conference, the rather handsome editor, Dr Aylwin Forbes. Here’s a short excerpt from their conversation – it’s a beautifully observed scene, characteristic of Pym’s ability to convey so much during a brief exchange. Viola named the journal which Aylwin Forbes edited. ‘I happen to know him rather well,’ she added. ‘He and I were once…’ Viola hesitated, teasing out the fringe of her black and silver stole. ‘I see,’ Dulcie said, but of course she did not see. What was it they were once, or had been once to each other? Lovers? Colleagues? Editor and assistant editor? Or had he merely seized her in his arms in some dusty library in a convenient corner by the card index catalogues one afternoon in spring? Impossible to tell, from Viola’s guarded hint. How irritating it sometimes was, the delicacy of women! ‘Is he married?’ asked Dulcie stoutly. ‘Oh, of course – in a sense, that is,’ said Viola impatiently. It turns out that Viola has a bit of history with Aylwin, having fallen for him while she was working on the index for one of his books at some point in the not-too-distant past. Even though very little actually happened between the two of them, Aylwin’s wife, Marjorie, must have found out about Viola as she ended up leaving her husband to move back in with her mother. With Aylwin effectively separated from Marjorie, Viola hopes to rekindle the relationship; Aylwin, on the other hand, seems more intent on avoiding Viola as far as possible. When she realises that Aylwin may not be terribly keen to get involved with her again, Viola turns to Dulcie for moral support. Like Mildred in Excellent Women, Dulcie is one of those reliable types who can be called upon in moments of distress, often putting the needs of others before her own, especially when it comes to matters of the heart. Somehow these two rather mismatched women end up staying in touch with one another after the conference, a connection that Viola is keen to utilise when she needs a new place to live. In this scene, Dulcie has taken a call from Viola asking if she can stay with her for a few weeks, just until she finds a new place to live. Even though deep down she knows she is being used, Dulcie cannot help feeling flattered and recognised in some way when Viola makes her approach. A few days later, Viola moves in with Dulcie and her eighteen-year-old niece, Laurel, who has come to stay with her aunt while she takes a course at secretarial college. Alongside the main characters, there is a large cast of secondary characters, most notably Dulcie’s next-door neighbour, Mrs Beltane, and her blue-rinsed poodle, Felix, the beady-eyed dog with a penchant for petit fours. Like Excellent Women, No Fond Return contains a number of rather comical set-pieces, all played out in this familiar Pym world of afternoon tea, jumble sales, church gatherings and various learned organisations. As one might expect, each scene is very keenly observed. Threaded through the novel are Dulcie’s observations and reflections on the nature of relationships, particularly those between men and women. On two or three occasions, she thinks back to her time with Maurice and wonders if it is sadder to have loved someone unworthy of her affection than never to have loved at all. (Maurice had not wanted to marry Dulcie, or as he put it ‘he was not worthy of her love’.) With the benefit of hindsight, she can now see that the marriage would have been a mistake. The suitability (or not) of various ‘matches’ is a key theme. When Dulcie meets Aylwin’s wife, Marjorie, she finds her rather dull and drab. Surely Aylwin would be better suited to someone who could support him and help him with his work? Someone like Dulcie, perhaps. (To complicate matters further, Aylwin has taken a fancy to Laurel, Dulcie’s young niece – and that relationship, should it ever become serious, would most certainly not be considered an appropriate match!) As the novel draws to a close, Dulcie begins to wonder whether all loving relationships have a touch of the ridiculous about them. Perhaps there aren’t any ‘perfect’ matches in life after all? At times, there is a sense that Dulcie finds it more comfortable to live vicariously through the lives of others rather than attempting to change her own. (There are a number of references to how characters might behave and how scenes might play out if they were in a novel.) Nevertheless, she remains open to new experiences and somewhat hopeful for the future; maybe, just maybe, there is a chance that love will be returned fondly after all. No Fond Return of Love is published by Virago Modern Classics; personal copy. This entry was posted in Book Reviews, Pym Barbara and tagged #ReadWomen, Barbara Pym, Book Review, Fiction, Hotels, UK, Virago Modern Classics on May 18, 2016 by JacquiWine. 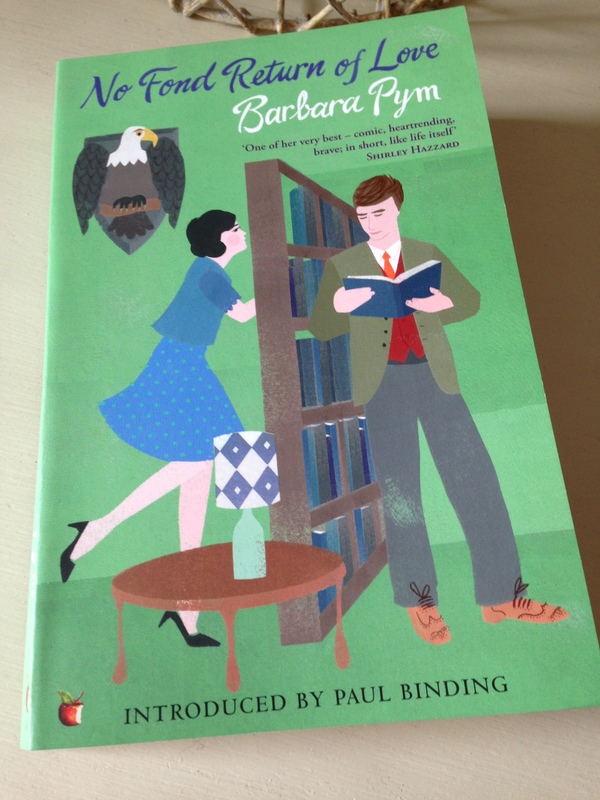 Like Elizabeth Taylor (whose Mrs Palfrey at the Claremont and A Game of Hide and Seek I reviewed fairly recently), Barbara Pym is another of those English novelists I’ve been meaning to try for some time. First published in 1952, Excellent Women was her second novel, and I believe many readers consider it to be one of her best. The novel is narrated by Mildred Lathbury, an unmarried woman in her early thirties, living alone in a flat in a down-at-heel part of London, ‘so very much the ‘wrong’ side of Victoria Station’. Mildred is very sensible, diplomatic and accommodating; in short, she is one of those ‘excellent women’ who can be relied on to offer a kind word or a cup of tea whenever others are in need of support. In many ways, she finds herself getting drawn into other people’s business, particularly as it is assumed that her status a spinster automatically means she has few commitments or worries of her own. As the daughter of a clergyman, Mildred is closely involved with the local Anglo-Catholic church where she helps the pastor, Julian Malory, and his sister, Winifred, with various activities (jumble sales, church bazaars and suchlike). Having never married, Julian and Winifred share a home at the vicarage – they are Mildred’s closest friends. Into Mildred’s unexciting but fairly settled life come Helena and Rocky Napier, a rather intriguing married couple who have spent the past few years living apart from one another. Helena, an anthropologist by profession, arrives first, moving into the flat below Mildred’s where she seems to spend many an evening entertaining her colleague, the rather standoffish Everard Bone. At first Mildred isn’t sure if she likes Helena, but she does her best to be polite and neighbourly. Rocky appears a few weeks later having just returned to England following an extended stint in the Navy. It soon becomes apparent that relations between Helena and Rocky are somewhat strained; consequently, Mildred’s skills as an excellent woman come in very handy as she attempts to mediate between the couple. Even though it is hard for her to take sides in this situation, Mildred finds Rocky particularly easy to talk to. He is attractive and charming, and Mildred is clearly brightened by his company. Matters are further complicated when the attractive widow, Allegra Gray, moves into the room at the top of the Malorys’ rectory. At first, everything is sweetness and light. As the former wife of a clergyman, Mrs Gray ought to be ideally suited to life at the vicarage. That said, it is not long before she upsets the balance at the Malorys’. Julian is clearly smitten with her…and when developments have a knock-on effect on Winifred, Mildred is called on for support. While Mildred is interested in the emotional lives of those around her, she values her own independence and does not feel the need to throw herself into relationships simply in the hope of finding a suitable husband. There are times when she feels she may have missed out on certain experiences in life, but in many ways she takes comfort from the fact that her current position as a spinster is familiar and uncomplicated. By contrast, other people around her seem intent on trying to do a spot of matchmaking. There are a number of occasions when Mildred’s friends and acquaintances seem to think they know what’s best for her (irrespective of Mildred’s own wishes). Take this example as Helena, Rocky and Mildred are travelling home after a night out with Everard Bone – the Napiers even go so far as to start talking about Mildred as if she were not present at the time. ‘You and Everard seemed to be having an interesting conversation,’ said Helena at last. ‘Was he declaring himself or something?’ Her tone was rather light and cruel as if it were the most impossible thing in the world. ‘He was telling me about his new flat,’ I said lamely. There are other men in Mildred’s life too; most notably the rather finickity William Caldicote, the brother of an old school friend, whom Mildred meets once a year for lunch, and Julian Malory, whom many consider her ideal (and possibly rightful) partner. Marriage is a central theme in this novel. Set as it is in a period when society placed a great deal of value on the institution of marriage, the story explores the idea of whether it is possible for a woman like Mildred to live ‘a full life’ if she remains unmarried. When she considers the stresses and strains of the Napiers’ marriage (not to mention the nature of developments between Julian Malory and Allegra Gray), Mildred is not at all convinced that she should marry. She does, however, value friendship and companionship in her life and hopes for more of these things in the future. 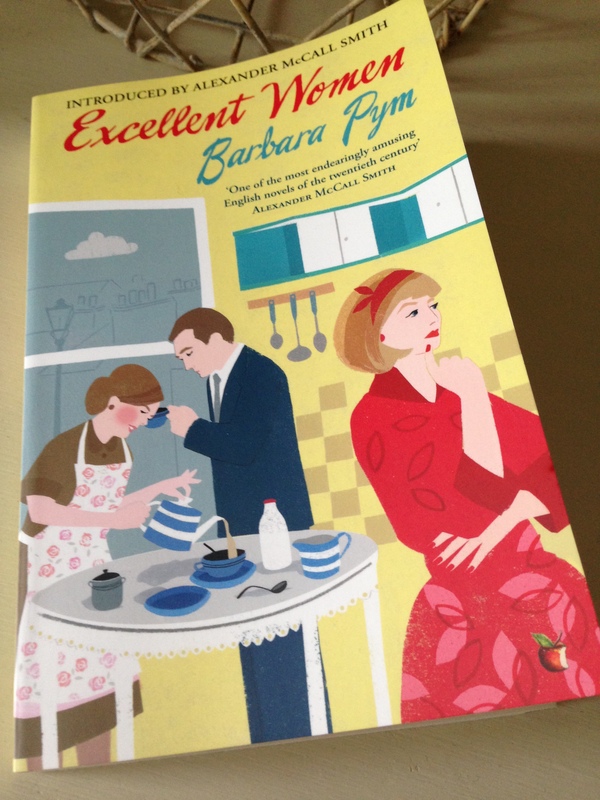 Excellent Women is my first experience of Barbara Pym’s work, and I hope it won’t be my last. I really enjoyed this story – it is beautifully observed, full of small but significant reflections on life in the 1950s. In many ways, the plot is secondary to other aspects of the novel as much of the focus falls on Mildred’s thoughts, feelings and observations. One of the things I liked most is Pym’s tendency to treat her characters with sympathy. She has a way of conveying humour alongside the difficulties that touch the everyday lives of these people, and yet there is a sense of insight and understanding in her writing, too. The novel includes several humorous scenes with much of the dry wit coming from the interactions between the characters. There is plenty of gossiping and friendly bickering amongst the volunteers as they organise the parish jumble sale and hold meetings to discuss forthcoming events. All in all, I found it a charming and engaging story. I’ll finish with a quote from one of the early chapters of the novel, partly because I think it illustrates a little of the humour in the story, Pym’s eye for dry comedy in the small tragedies of everyday life. In this scene, Mildred has joined the Malorys for dinner at the vicarage. I sat down at the table without any very high hopes, for both Julian and Winifred, as is often the way with good, unworldly people, hardly noticed what they ate or drank, so that a meal with them was a doubtful pleasure. Mrs Jubb, who might have been quite a good cook with any encouragement, must have lost heart long ago. Tonight she set before us a pale macaroni cheese and a dish of boiled potatoes, and I noticed a blancmange or ‘shape’, also of an indeterminate colour, in a glass dish on the sideboard. For other perspectives on this book, here are links to posts by Kaggsy, Ali, Victoria, Jane and Alex. Excellent Women is published by Virago Modern Classics. Source: personal copy. This entry was posted in Book Reviews, Pym Barbara and tagged #ReadWomen, Barbara Pym, Book Review, Classics Club, Fiction, UK, Virago Modern Classics on January 26, 2016 by JacquiWine.